Pope Saint Fabian was bishop of Rome from January 236 to January 20, 250 C.E., succeeding Anterus. He is famous for the miraculous nature of his election, in which a dove is said to have descended on his head to mark him as the Holy Spirit's unexpected choice to become the next pope. He was succeeded by Cornelius. Fabian's episcopacy was one of substantial importance in the history of the early church. Most of his papacy was characterized by amicable relations with the imperial government, and Fabian could thus bring back to Rome the bodies of Pope Pontian and the antipope Hippolytus, both of whom had died in exile in the Sardinian mines, for Christian burial. It was also probably during his reign that the schism between the two corresponding Roman congregations of these leaders was ended. He corresponded with Origen and was highly esteemed both by Cyprian, the bishop of Carthage, and by the antipope Novatian, who referred to Fabian's "noblest memory." The remainder of our information about Fabian is less reliable. The Liber Pontificalis says that he divided Rome into deaconates and appointed secretaries to collect the records of the martyrs. He is also said, probably without basis, to have baptized the emperor Philip the Arab and his son. More plausible is the report in the Liberian Catalog that he sent out seven "apostles to the Gauls" as missionaries. Fabian was martyred during the persecution of Christians under Emperor Decius, one of the first to die during this period, on January 20, 250. He was buried in the catacomb of Callixtus, and the Greek inscription on his tomb has survived. 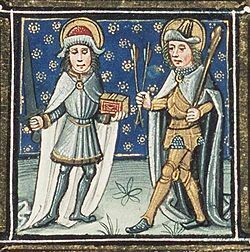 Fabian's feast day is commemorated on January 20, the same as Saint Sebastian, in whose church his sepulcher lies in Rome. According the Liber Pontificalis, Fabian was a Roman by birth, and his father's name was Fabius. Nothing more is known about his background. The legend concerning the circumstances of his election is preserved by the fourth century writer Eusebius of Caesaria (Church History VI.29). After the short reign of Pope Anterus, Fabian had come to Rome from the countryside when the new election began. "Although present," says Eusebius, Fabian "was in the mind of none." While the names of several illustrious and noble churchmen were being considered, a dove suddenly descended upon the head of Fabian. To the assembled electors, this strange sight recalled the gospel scene of the descent of the Holy Spirit on Jesus at the time of his baptism by John the Baptist. Believing the current dove's flight to be divinely inspired, they unanimously chose Fabian to be the next pope. During Fabian's reign of 14 years, there was a lull in the storm of persecution which had resulted in the exile of both Aterus' predecessor Pontian and the antipope (and later saint) Hippolytus. Fabian had enough influence at court to effect the return of the bodies of both of these martyrs from Sardinia, where they had died at hard labor in the mines. The report that he baptized the emperor Philip the Arab and his son, however, is probably a legend, although he did seem to enjoy some connections at court, since the bodies of Pontian and Aterus could not have been exhumed without the emperor's approval. It was probably during Fabian's reign that the congregation of Hippolytus was brought back into communion with the main body of the Roman church. The underlying issues of the schism, however, were not completely resolved. These involved the issue of the purity of the church, especially the integrity of the clergy during the persecution and the forgiveness of serious sins like adultery. 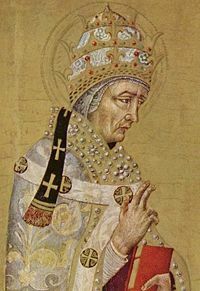 One of the bishops apparently consecrated by Fabian, namely Novatian, would go on to become the next antipope and form a long-lasting and widespread schism, based in part on these very issues. The Liber Pontificalis says that Fabian divided Rome into seven districts, each supervised by a deacon. Eusebius adds that he appointed seven subdeacons to help collect the acta of the martyrs—the reports of the court proceedings on the occasion of their trials (cf. Eusebius, VI.43). There is also a tradition that he instituted the four minor clerical orders: Porter, lector, exorcist, and acolyte. However most scholars believe these offices evolved gradually and were formally instituted at a later date. The Liberian Catalogue of the popes adds that Fabian initiated considerable work on the catacombs, where honored Christians were buried, and where he also caused the body of Pope Pontian to be entombed at the catacomb St. Callixtus. Later accounts attribute to him the consecration (c. 245) of seven bishops as missionaries to Gaul: Gatien to Tours, Trophimus to Arles, Paul to Narbonne, Saturnin to Toulouse, Denys to Paris, Austromoine to Clermont, and Martial to Limoges. The famous Christian teacher and scholar Origen wrote to Fabian, as well as to many other bishops, defending the orthodoxy of his teaching (Eusebius, Church History VI.34), which had been condemned both at Alexandria and later in Rome, in a synod over which Anterus had probably presided. Cyprian of Carthage mentions the condemnation by Fabian of a certain Bishop Privatus of Lambaesa in Africa for heresy (Ep., 54). Fabian with Saint Sebastian: the feast of both of these saints' is celebrated on January 20. With the advent of Emperor Decius, the Roman government's tolerant policy toward Christianity temporarily ended. Decius ordered leading Christians to demonstrate their loyalty to Rome by offering incense to the icons of deities which represented the Roman state. This, of course, was unacceptable to many Christians, who, while no longer holding most of the laws of the Old Testament to apply to them, took the commandment against idolatry with deadly seriousness. Fabian was thus one of the earliest victims of Decius, dying as a martyr on January 20, 250, at the beginning of the Decian persecution, probably in prison rather than by execution. He was buried in the crypt of the popes in the Catacomb of St. Callixtus which he himself had helped to improve. In modern times the Italian archaeologist Giovanni Battista de Rossi discovered his epitaph: "Fabian, bishop and martyr" (Roma Sotterranea II, 59). 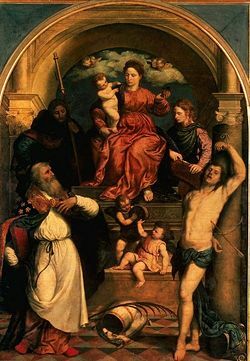 The tradition of Fabian's martyrdom is thus accepted as historical, in contrast to the traditional martyrdoms of most of the earlier popes, which are now considered dubious. In art, he is often pictured with Saint Sebastian, whose feast day he shares on January 20. 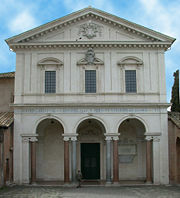 The church of Saint Sebastian, where Fabian's sarcophagus was discovered in 1915. Fabian's reign marks the beginning of the period in which the Roman bishop was clearly afforded significant honor not only by his own church but by those of other cities as well. While not yet a "pope" in the sense used the term today, he was much respected by the leading clergymen of his era, and his death as a martyr may be considered fairly well attested. He was also apparently a peacemaker and a unifier, bringing about the reconciliation of the formerly schismatic congregation led by the antipope Hippolytus and causing this future saint to be given a Christian burial. In 1915, a sarcophagus bearing Fabian's name was discovered in the church of Saint Sebastian at the Catacombs, making it probable that his remains were removed there as a later date. A number of writings ascribed to Fabian in the Middle Ages are now considered to be forgeries. They form part of the Pseudo-Isidorian Decretals, a ninth-century collection of canons by a certain "Isidore Mercator," designed to bolster the papacy's claim to ancient authority and supremacy. Pope Saint Fabian, it's so easy to believe that peace means a life without conflict or suffering. Help us to see that the only true peace is the peace Christ brings. Never let us as a Church or as individual Christians choose to deny our beliefs simply to avoid an unpleasant situation. Amen. This page was last modified on 31 March 2019, at 22:51.